Michelin Tires - Latitude Tour... a Terrific Crossover / SUV Tire? Michelin Tires - Latitude Tour have mixed reviews... that's for sure. Taking a little time to learn what actual owners of these tires are saying will help you decide if these tires are right for you. Not all Michelin tires get great reviews (although they are among the best overall rated tire). We have found it strange that certain sites that sell these tires have more favorable reviews, but all the reviews we found had a common thread... a fair percentage of people had bad experiences with these tires. The tricky part is figuring out what driving conditions or style produce bad reviews for tire consumers. First... how does both the manufacturer and online tire sales outfits position Latitude tires? Regarding the Latitude Tour HP - This is a SUV/Crossover All-Season Tire that provides improved handling in both rain and snow. They have what Michelin calls '2-D locking sips' that that offer greater rigidity. There are also supposed fuel savings because of this tier's shape and tread compounds. Of course, there isn't any elaboration on why this would increase fuel efficiency so I'll assume that this blurb was added to fill white space. Ok... are you still with me? This is where we start moving past how the tire manufacture markets the tire, and what people are actually saying about this tire. For mostly highway driving, these tires have gotten pretty good reviews. Many folks have said that they typically only get 40K miles on their tires, but with the Latitude tires they are exceeding 60K miles. "highway winter handling compares well with the Goodyear Tripple-Tred. The Michelin is quiet, and when driven in wet conditions the handling is excellent." "These tires are not as responsive as the Goodyear on dry pavement. Nevertheless, this is an wonderful tire that brings a a ride that is quite smooth and quiet." "I review my tires calibration with my speedometer using my GPS. At 60 miles per hour my milage was reduced from 24 - 26 MPG to 20 -21 Miles per gallon. Once I passed 3000 miles the tires began to vibrate as well". "The handling of these tires in the snow was sub-par. In deeper snow the tires were very slippery, even with my SUV which has traction control. We also have a sedan which handled better, but I have decided to try and return these back to Walmart tires for something else." "I drive a Ford sedan and have over 40,000 miles on these Latitude tires, and I still have about half the tread left. My driving conditions cover dry, wet, and snowy conditions and I have been truly happy with these Michelins. We often take trips to the mountains, as well as simply driving around town. In below 35 conditions they did stiffen up, but that's expected and they still performed quite well. I have read reviews about road noise, but I have not experiences any. We will continue to purchase these tires in the future." This tire reviewer feels that he got a defected tire... we are taking this review with a grain of salt. It could be that the consumer damaged the tire on a curb (there are two sides to every story). "I drive a large SUV and have only 47,000 miles on these tires. Lately I have found that they are not holding air. Evidently there was a crack in the sidewall around the tire lettering. Michelin refused to replace the tire. This cost me well over $200 to replace. I will never buy Michelin tires again. " As we said earlier, there are mixed reviews. It seems as though folks that drive a lot in dry weather, or on more textured highways, felt that these tires were quite noisy. 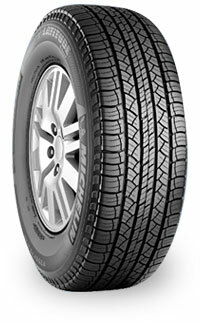 Check out the reviews on other Michelin tires (see link below). Also, read more indepth reviews of this tire before purchasing. There are many reviews to be found on tirerack.com's website. Latitude OEM tires would not balance. Constant buzzing noise at all speeds, coming from tread design. Far from quiet, and I am surprised no other mention can be found. Can't be worse than CooperCS4's which wore out after 28,000 miles. They wore even, but tread was gone!